Summary: What if inspiration came to visit...and wouldn't leave? When it comes to movie reviews, critic Violet Epps is a powerhouse voice. But that's only because she's learned to channel her literary hero, Dorothy Parker, the most celebrated and scathing wit of the 20th century. Determined to defeat her social anxiety, Violet visits the Algonquin Hotel to pull strength from the hallowed dining room, where Dorothy Parker and so many other famous writers of the 1920s traded barbs. But she gets more than she bargained for when Dorothy Parker's feisty spirit rematerializes from an ancient guestbook and hitches a ride onto her life. Violet is shocked and thrilled to be face-to-face with her idol, but when the gin-swilling writer takes up residence in her home and grows pricklier and more outspoken by the day, the timid movie critic is pushed to her limit. With her job threatened, her new relationship in tatters, and the custody fight for her orphaned niece in jeopardy, Violet is forced to face her fears ...and she makes sure Mrs. Parker does the same. A few weeks ago, I decided that I wanted to read something for fun, so I headed down to the basement and grabbed FAREWELL, DOROTHY PARKER by Ellen Meister from my stack of books. When I read the description, I thought it might be smart chick lit; and that's pretty much how I'd summarize it after reading the novel too. FAREWELL, DOROTHY PARKER was an entertaining read, but it also had some substance. FAREWELL, DOROTHY PARKER tells the story of Violet, a famous movie critic who is known for her smart and sassy opinions. However in real life, Violet is pretty much the opposite. She doesn't act like a confident woman especially when it comes to her relationships, and she doesn't even have the courage to tell her loser boyfriend what she thinks of him. Violet decides to meet him at the Algonquin Hotel -- the meeting place of her idol Dorothy Parker and other famous writers -- to finally break the news to him. Once again, Violet finds that her courage is lacking and she is unable to way what she really thinks... until Dorothy Parker's ghost magically appears from the hotel's guestbook. Ms. Parker ends up returning home with Violet and begins "educating" Violet with her scathing wit and outspokenness. The question is, "Can Ms. Parker's ghost give Violet the confidence and tools she needs in her personal life to deal with her mooching boyfriend, her career problems, and even the custody fight for her niece?" Overall, I thought FAREWELL, DOROTHY PARKER was a cute read. It was funny and sweet, but it also touched upon some serious issues. I think what I appreciated the most about this novel was how much I "learned" about Dorothy Parker. I knew very little about her prior to picking up this book except for a few of her famous sayings, and I liked how the author showed another side to Ms. Parker... while also featuring her trademark wit. It was apparent to me that Ms. Meister thoroughly researched Ms. Parker and the time period in which she lived. She even included some information about Dorothy Parker in her Author's Notes at the end of the novel. However, what really impressed me was how well she seemed to capture Ms. Parker's voice and personality. I couldn't help but laugh at Ms. Parker's strong opinions and insight into Violet's life. I also really enjoyed Violet's character... most of the time! My heart did go out to her, especially after I learned what she'd been through, but I definitely wanted her to get more of a spine when it came to her personal life. It was heartwarming to see how Violet evolved, with the help of Dorothy Parker's spirit, and how she eventually gained her own voice. FAREWELL, DOROTHY PARKER would make for a very fun book club discussion. It might even be fun to read some of Ms. Parker's works to complement the novel. There is a reading guide available with nine questions. Some of the themes you might want to explore include social anxiety, self-confidence, mentoring relationships, and grief. 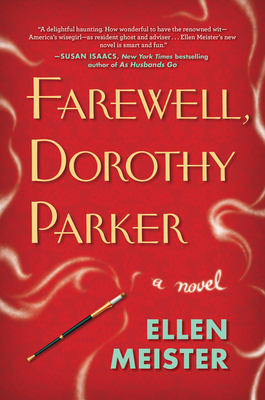 If you are looking for a cute book that also has some substance, then I recommend giving FAREWELL, DOROTHY PARKER a try. Oh this would be fun read after Z, since the Fitzgeralds knew Parker. I don't know much about Dorothy Parker either but would love to learn. I actually got this book at the Algonquin last year! "Only one drink, two at most, three I'll be under the table, and four I'll be under the host."